"American Paranormal: Bigfoot." You must see the program on large screen television to appreciate certain details of the analysis and anatomy, but for those of you outside the U.S. and Canada, there is a low-res YouTube version available. Click the icon above. Check the homepage for this series for the next scheduled broadcast ... on the newly redeemed National Geographic Channel. Do tell your friends to tune in. As one BF blogger already said, this documentary really "hits it out of the park!" But what about the rumors? What about the rumor that one of the people who helped obtain the footage "confessed" to wearing the costume? Some of those bogus stories have been commercially exploited in books and TV documentaries. That his how most people have "heard" that the Patterson footage was "proven to be a hoax". On this page you will find links to youtubery of the most influential documentaries, and some relevant background informaton most influential rumor of all -- the Hieronimous "confession". Thankfully, in January 2010 new information was presented on television which graphicly demonstrates that all of those costume stories were falsified. A new documentary on the National Geographic Channel titled "American Paranormal: Bigfoot" presented some compelling math and anatomy to show it's not a costume at all. The strategy for analysis of the Patterson creature built upon strategies employed in prior documentaries, namely "Sasquatch: Legend Meets Science" and at least one episode of Monsterquest (History Channel). The math is there to be re-examined, anytime. There wasn't sufficient time in the documentary to examine any of the pervasive hoax rumors still floating around, but that can be done here. Between the beginning of 1996 and the end of 1999, a new crop of PGF debunking rumors blossomed, as large segments of the North American population were connecting to the Internet for the first time. Some of those claims were promoted by clever opportunists. A handful of these rumors received regional press attention. A few received national press attention. The stories did not corroborate each other. They were all contradictory in their details, but they all claimed to debunk the Patterson footage. After a while it became increasingly ludicrous to hear more stories claiming to be the "final resolution of the mystery." Ironically, the most influential rumor floating around today is the one inadvertently promoted by the National Geographic Channel a few years back, in 2005 ... The series title was "Is it Real?". 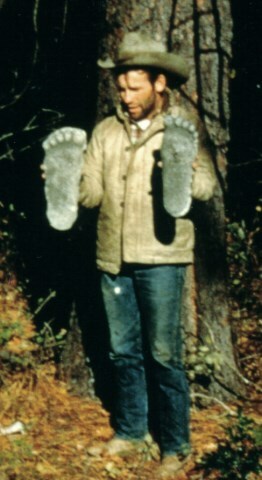 The episode title was "Bigfoot." Youtubery of this old episode can be accessed below. The episode featured a new liar "confessing" to be "the man in the costume." His name is Bob Hieronimous. Millions of people apparently saw that episode, or heard about it from others, because people often bring it up with us. His "confession" has even found its way into foreign publications describing nature mysteries around the world. At least this confessor lived in Yakima (where Patterson was from). Hieronimous claims he was friends with Roger Patterson, and accompanied Patterson and Gimlin to Nor Cal with his costume. Patterson's widow says he's lying. Bob Gimlin says he's lying. No one can corroborate Hieronimous' claim that he accompanied Patterson and Gimlin. Various living witnesses near Bluff Creek say Patterson and Gimlin were not accompanied by anyone. No one ever saw Hieronimous with those two. Hieronimous doesn't know where they went exactly, or which route they too ... Indeed, there is every reason to believe Hieronimous is trying to attach himself to the Patterson story with his own fiction. Roger Patterson apparently knew Bob Hieronimous before he obtained the footage in 1967. Patterson had been wanting to film a low budget documentary about the subject. He organzied some people in Yakima for some stock scenes on horseback for his film. Bob Hieronimous was apparently one of those people, but that appears to be the extend of his assocation with Roger. 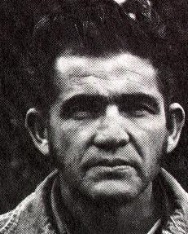 In the nine years between the widely publicized Jerry Crew tracks in October, 1958, and the Patterson-Gimlin footage in October, 1967, several people in the Northwest had the idea of making a documentary about the bigfoot mystery, but only a few actually made progress in that direction. Patterson was, apparently, the only one among them who was willing and capable of leading extended horsepacking trips in the mountains where tracks were being found most often -- down around Bluff Creek, California. Hieronimous may have looked for a different way to obtain footage -- a much easier way, closer to home. Hieronimous was aware of the widespread interest in the topic. Based on his own statements, it is obvious that he only looked upon the mystery as a opportunity for cashing in somehow. He may have acquired his own cheap gorilla costume before 1967 in preparation for hoaxing his own footage. There are statements from people around Yakima who recall Hieronimous having some kind of furry costume in his trunk during that period, and remember his claims that he would try to fool some people with it. So there may have been a costume in his possession in the mid-1960's, but he didn't hang on to it, nor did anyone take a photo of him wearing it. Hieronimous is, in fact, one of Bob Gimlin's neighbors, but Gimlin had little social contact with him over the years. Gimlin has boarded and trained horses for decades. It was not uncommon to for him to board horses of neighbors. 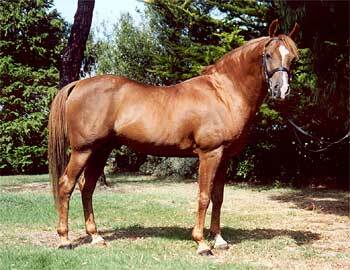 During the late 1960's one of the horses he boarded was owned by Hieronimous. It was, in fact, Hieronimous' horse that Bob brought down to Bluff Creek in 1967. If Hieronimous had felt left out of Patterson's project by 1967, it would have added insult to injury to learn that his own horse was used by Gimlin on the horse trip that made them both famous. Born in Missouri in 1931 and relocated to Yakima at a young age, Bob Gimlin is a tough but intriguing character. Part Chirokowa Apache, and a former Navy boxing champion, and a former rodeo contender, he is adored by the nearby Yakama Indian tribe, having trained many of their mountain horses. After remaining silent about the PGF for nearly 30 years (to protect his wife's job as a bank officer), Bob Gimlin finally attended his first bigfoot conference in Willow Creek, California 2003. Now he periodically speaks at bigfoot conferences across the country. His name sells out auditoriums. People come from far and wide to meet him and ask him personally about the incident at Bluff Creek that day in 1967. Old-timers around Yakima delicately hint at the contrasts between these two Bobs. One of the people who helped shape the Hieronimous story for the press is a notorious publicity scam-artist named Kal Korff -- a man described by national radio talk show host Art Bell as "the most brazen media deceiver in the country". He is more well known among UFO research circles, and JFK Assassination Conspiracy circles. Korff is a curious species of self-promoter. Watch the video above to ascertain Korff's credibility. He has a delusional pathology similar to the late Erik Beckjord, combined with the publicity seeking compulsions of Biscardi. Bob Gimlin (right) is an authentic horse-whisperer, straight out of an old Disney film. He was a champion in his day (champion boxer, rodeo contender, etc.). He worked in a variety of jobs and eventually became a full-time horse trainer, his true passion in life. 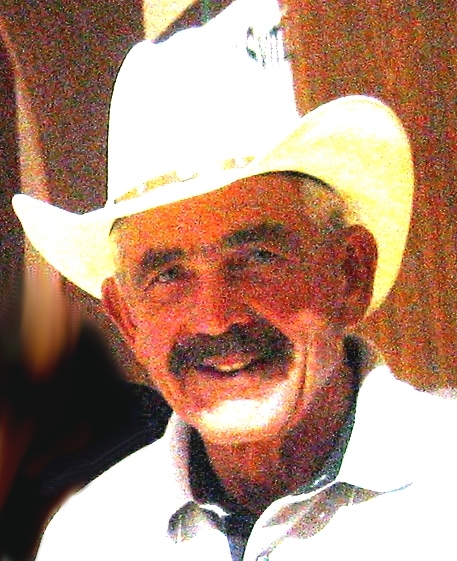 The reason Gimlin was involved with the Patterson footage to begin with was because of his reputation as a talented horseman. Patterson needed the toughest, most dependable horseman he could find for that 1967 trip in the mountains of Nor Cal. Everyone knew Gimlin was the best of the best in the region when it came to the sort of venture Patterson was proposing. Yakima folks say Bob Hieronimous, by contrast, was always an under-achiever, since he was young. His bare-minimum work ethic won him no admirers in the community. He didn't have many friends, compared to Gimlin. Gimlin had a rather large circle of friends in the Yakima Valley. Hieronimous lives right down the street from Bob and Judy Gimlin. Compared to the Hieronimous property, the Gimlins seem to have done nicely for themselves. The Gimlins' home has always been well maintained, and nicely painted, and the landscaping nicely manicured. The Gimlins always had nicer, newer vehicles in their driveway too. The Hieronimous family could never keep up with those Joneses. It was a formula for envy in a small western town. Hieronimous had been telling people in Yakima bars for years that he would someday find a way to make money off the Patterson footage, like his famous neighbor did. But Gimlin never made any money off the PGF, though many people around Yakima assumed he did. When Hieronimous was asked, during an in-depth, on-camera interview why he was coming forward 40 years after the fact ... his reply confused the interviewer a bit. Hieronimous said, "All these people have been making money off that footage for years. It's my turn now." See that interview below. He was referring to all the other people who had claimed to be involved with the footage, who Hieronimous assumed made money from their claims. It was time for him to get a piece of that action. Gimlin's life story is an inspiring one. It was a progression of achievements, then harsh setbacks, and then even bigger achievements. He began working in Washington's apple orchards at age 10, and worked continuously throughout World War II. When he was old enough, he joined the Navy and eventually became a champion Navy boxer. His Navy boxing career was cut short by an auto accident. The accident left him severely injured and hospitalized for more than a year. As soon as he could walk again, Gimlin went back to work, doing everything from construction to demolition, to horse training, to rodeo riding, usually holding two jobs and working late hours. He did this until he could train horses full-time. Today, in his 70's, Gimlin still works part-time as a horse trainer. He breaks and trains a particular breed of horse: the sure-footed, quiet-stepping Rocky Mountain horse. Its the ideal form of transportation for sneaking up on skittish wild animals. Gimlin's wife, Judy, also worked diligently for decades. She began as a bank teller at the oldest savings and loan in Yakima. She eventually advanced to the rank of corporate officer for that savings and loan chain. She retired a few years ago, after 40 years with the same employer. At one point during their younger years, Gimlin and Hieronimous were both hired by the same large industrial employer in Yakima, along with many other men in Yakima. In time, Bob Gimlin became a valuable employee for the company. Whereas, Bob Hieronimous showed little motivation and opted to perform light janitorial work around the facility. He swept up a bit, and changed a sprinkler head every so often, and spent a lot of time in the coffee room ... His supervisors eventually transferred him to a different facility. There he was kept busy stacking empty palettes and making deliveries of sodas. From Hieronimous' own statements, one can sense his envy of Gimlin's prosperity, and his feeling of being cheated out of that same level of prosperity. Roger Patterson holding casts at Bluff Creek following the incident. Patterson and Gimlin were both quintessentially western characters, in a quintessentially western moment -- two tough, brave entrepreneurs on horseback, each with his own special talents and skills, including rodeo riding. They had all the right stuff at that moment in 1967, to film a fleeting encounter with an ancient legend. Believing and preaching that Gimlin's prosperity derived from a hoax, kinda sorta justified Hieronimous' own hoax, and also rationalized his own lack of success in life. For many years Hieronimus grumbled to folks in Yakima bars that his neighbor's good fortune did not come from honest work, but rather from the proceeds of the Patterson footage. 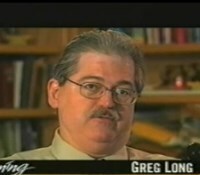 The primary writer of the book promoting the new "confession", is a man named Greg Long. Greg Long came to this book project with a definite agenda for casting doubt and aspersions on the Patterson creature. His path to undermining the creature was to characterize the filmographer as a petty crook. Now people around Yakima are talking about their dealings with him, and the stories they say he distorted and stretched in his book. The book was designed to attach itself to any future debate about the subject-- a debate that has become a fixture in many writing & journalism classes, at the high school level, and undergrad level. In the video above, Kal Korff talks about his involvement with Greg Long, Bob Hieronimous, and the making of "The Making of Bigfoot." 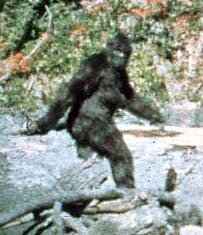 Gimlin's association with the famous footage, and the common assumption that it was a hoax, became such an annoyance to him and his wife by the end of the 1970's that he eventually refused to speak about the matter publicly, for nearly three decades ... until he learned of his envious neighbor's phony story about wearing the costume. That's when Gimlin finally broke his long silence. When Greg Long was assembling the book featuring Hieronimous' confession, Gimlin was not yet talking. The parasitic trio (Long, Korff, Hieronimous) assumed he never would talk to the press, because he had avoided the press during the previous Patterson debunking scams. It was bad gamble. Nowadays Gimlin attends bigfoot conferences ever so often. He is not shy to discuss things, especially the lies of Hieronimous, Korff and Long -- their lies about himself and about Roger Patterson. Hieronimous' late-blooming "confession" is debunkable in various ways (listed further down in this article). Certain aspects are debunkable by author John Green. Other aspects are debunkable by Bob Gimlin and/or Patricia Patterson (Roger Patterson's widow). Both still live in different parts of Yakima, and both are available to speak to qualified journalists about this particular subject. As it turns out, some of the Yakima residents who were quoted by Greg Long in his book now say their stories and comments about Roger were distorted in his book. They say Long seemed to be on a mission to make Roger Patterson out to be a petty criminal. Roger was an unsophisticated cowboy, but a highly motivated, multi-skilled cowboy with big aspirations. Only a few years after obtaining the footage he was diagnosed with terminal cancer. He died in 1972, at the age of 46. Apparently (and not surprisingly) Roger had not repaid all his personal debts, or completed all his planned projects, or returned all his borrowed items, before his cancer put him into the bed where he eventually died. People who die of cancer in their prime of life often leave behind a lot of loose ends and debts. Does that make them petty criminals? Greg Long would have you think so. The real story behind the Patterson-Gimlin footage is a remarkable intersection of uniquely western talents, bravery and entrepreneurial motivation. Had Gimlin not been a gifted handler of quiet-stepping Rocky Mountain horses, and had Patterson not been a seasoned rodeo rider, with a strong drive to make documentary about sasquatches ... the footage would probably not exist. When the two men came into view of the creature, Roger's normally unspookable mountain horse reared up in panic and fell over on him. Roger's leg was pinned to the ground. With a thrashing horse pinning him to the ground, he pulled himself out from underneath it, and whipped out a 16mm camera from a saddle bag, and then dashed toward the fleeing figure, finally steadying his aim as it walked away. It all happened faster than it takes to describe. You get a sense of how fast it actually happened when you watch the unstabilized full version of the footage. It was a violent burst of energy and motion, then a quickly steadied control of his body and hands -- the characteristic maneuvers of a seasoned rodeo rider. Patterson was not a hoaxer. Patterson was an authentic cowboy, on an authentic cowboy mission. He accomplished that mission on the afternoon of October 20, 1967... and then died from cancer a few years later (probably due to his cowboy lifestyle ...). In 2005 a Seattle TV station produced an episode for "Evening Magazine" which focused on the Hieronimous claims. This program took a much more critical approach than the "Is it Real?" segment with Hieronimous. They also included clips of Canadian author John Green refuting the claims of Hieronimous. See also: The article written by Canadian Bill Miller, mentioning other factors relevant to the credibility of Hieronimous' story, or lack thereof. Even though the Hieronimous story is bogus, many people will claim they "heard the Patterson footage was proven to be a hoax" for years to come because of him and that 2005 Nat Geo documentary. The 2005 documentary on the National Geographic Channel was titled "Bigfoot: Is it Real?" You can watch the entire documentary by clicking the vertical icon on the left. The parasite trio (Long, Korff and Hieronimous) managed to use this documentary to promote their deceptive book, "The Making of Bigfoot." Before the book's release, Long and Korff warned and promised (Biscardi-esque style) that the book would "blow the lid off the subject". Among other things, the trio hoped their book would enrage everyone in the bigfoot research community, thereby baiting those folks to debate it extensively online. All three of these guys delighted in that idea. It gave them a feeling of power over bigfoot researchers. Many people also heard a different man-in-the-costume "revelation" on a 1998 TV documentary on the Fox Entertainment Channel. It was titled "World's Greatest Hoaxes". You can watch the entire "World's Greatest Hoaxes" documentary by clicking the vertical icon on the right. See that documentary below, split into three parts. Packham's parting statements/summation, toward the end of part three, is the most ludicrous portion of the whole documentary. By the BBC's standards, Packham's narration and investigative style is amazingly self-serving, and strangely self-contradictory. Among Packham's tricks was his clever editing of the phone call with Bob Gimlin. What you don't see or hear in the documentary: Packham manipulatively goaded Gimlin on the phone into making some type of equivocating statement about the footage. Packham needed that type of statement from Gimlin. He needed something he could deceptively twist as "confession" by Gimlin that he's "not entirely sure" of what he saw that day. Packham goaded that type of statement by asking Gimlin, in such a tone as to gauge his reasonability ... if there could have been "any possibility at all" that it was a hoax. To which Gimlin gave an answer demonstrating that he wasn't too narrow-minded to consider the hoax possibility. Gimlin says Packham edited the phone conversation so it sounded like Packham merely asked Gimlin whether he "thinks it was a man rather than an animal." In that context Gimlin's response sounds much more equivocating than it was intended to be. But Packham had what he needed -- a statement that could be stretched to sound like doubts on the part of Gimlin. Not unlike Greg Long, Packham was on a predetermined mission to cast doubt on Roger and the footage. He had promises to keep back home. The second deception was the costume. In this regard the American version of this X-Creatures episode was quite different from the version broadcast on British TV. The American version (shown on the Discovery Channel) focused attention on the Hollywood costume designer's attempt to build a "matching" costume. The British version left this part out completely. During the costume building sequence the designer hints at the difficulty they had matching their costume to the figure in the footage. Among other things, they could not match the fur with artificial fur, and they could not recreate the large moving muscles in the Patterson figure. Nevertheless, Packham touted their creation as an "exact match" of the Patterson creature, and even showed the "matching" costumes side by side ..
Packham's script in "X Creatures" goes immediately to work deceiving the audience from the beginning. He explains that the subject really began with the Patterson footage. "It all goes back to the Patterson footage," he says. One of the big markets for the program was relatively uninformed British and European audiences -- audiences that wouldn't question the premise that the Bigfoot legend arose from the Patterson footage. The bigfoot legend pre-dates the Patterson footage by several decades, at least. If you, or someone you know, has a copy of Discovery Channel's version of X-Creatures: Bigfoot. Please upload the whole thing to YouTube and let us know. We'd like to link to it. Of particular importance, is the portion where the costume designers are running into problems recreating the Patterson "costume". Dr. Jeff Meldrum, Professor of Anthropology at Idaho State University in Pocatella. The image above shows him giving an authoritative lecture about the Patterson-Gimlin footage at a bigfoot conference. 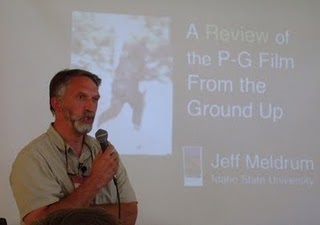 The PGF has tremendous significance for bigfoot research. To the public it represents both the purported creature, and the controversy over its reality. To most bigfoot researchers ("bigfooters"), the PGF is what it appears to be -- a unique peek at a surviving giant ape species, in North America. For a few years now, they have wanted to put this latest false confession to rest, because of how it affects attitudes toward the subject and public perceptions about all other bigfoot-related evidence. 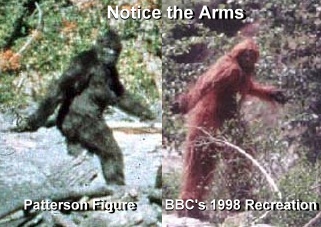 If the Patterson footage is fake ... then how can anyone have confidence in any other bigfoot footage? But that's exactly what PGF parasites take advantage of. They know that many people are so emotionally invested in the PGF images, they'll actually spend money on a book promising to reveal the truth about the footage, even if the book is a hoax itself. It may be impossible to scientifically prove that a given clip of bigfoot footage is authentic (without physical remains to authenticate it), but it is not impossible to disprove a fraudulent debunking like the Hieronimous "confession". In the summer of 1967 Gimlin was asked to accompany his friend and fellow rodeo rider Roger Patterson on a horsepacking trip to Northern California. Patterson wanted to obtain footage of a sasquatch for his own documentary about the subject. Gimlin was regarded as the best horseman in the Yakima region -- the obvious choice for a partner on a long horsepacking trip. As we all know, Patterson obtained some footage on that trip, but Gimlin never earned anything from it. After Roger died, Gimlin assumed he had no legal claim to any proceeds from the footage. He eventually signed a document transferring any *potential rights* in the footage to Canadian sasquatch researcher Rene Dahinden. Dahinden had harassed the Gimlins so much that Bob finally signed the agreement just to make Dahinden go away. Dahinden paid Gimlin $1.00 to relinquish those potential rights to him. Dahinden ran with that for years, sending letters from lawyers to TV production companies that used the footage. He demanded a $500 fee from those production companies that used the footage on TV, and he usually got it. Those TV rights actually belonged to Patricia Patterson but she did not have the network of groupies that Dahinden had. Dahinden had a decent following of people who would always tip him off to various TV programs in America that used the footage. Only after Dahinden died in 2001 did Patricia come to learn what Dahinden had been doing all those years, after Bob Gimlin signed that agreement in exchange for $1.00. Gimlin and Patricia Patterson are quite adamant that Hieronimus did not have anything to do with the footage, or the trip to Northern California. Author John Green says Hieronimus' description of the 1967 Nor Cal trip and his timeline don't match up with the facts, not by a long shot. 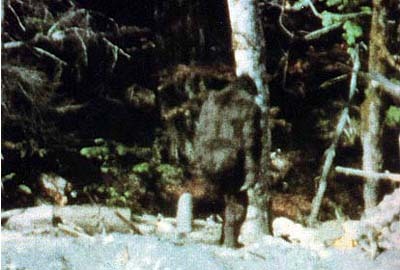 Gimlin is equally adamant that the encounter filmed in Bluff Creek that day involved a real animal, not a man in a costume. Hieronimus' initial ploy was to quickly sell his "confession" to the tabloids for a heap of money. It seemed like a slam dunk. There were a few papers around Yakima that fell for the "confession" and printed short articles about it ... but the tabloids didn't bite. With no visual evidence to back up his claim, they didn't need to pay a heap of money to him. Tabloid staff writers could fabricate more sensational bigfoot stories on their own. Eventually Hieronimus' "confession" caught the attention of other opportunists, like Greg Long and Kal Korff, who came to Hieronimus with book and film plans for the confession. In one part of the program Hieronimous boasts that "the scientists all say no human can walk like this figure." On several occasions he has given a demonstration of the "bigfoot walk" while wearing cowboy boots with significant heels, which tend to keep the knees more bent when walking. His "bigfoot walk" seems close enough, at first glance, to casual observers. Hieronimous draws your attention to his walking style, distracting attention from what is most strikingly different between the two figures -- the limb ratios (arm length vs. leg length). Quite clearly the figure in the Patterson footage has a different skeleton than Hieronimous. The comparative overlay above, by itself, visually proves that Hieronimous was not the Patterson creature, beyond any shadow of a doubt. 1) Hieronimus has given three (3) contradictory versions of his confession to various journalists -- contradictory regarding the "costume" description. Specifically, he has changed his description of the costume, dramatically, three times. The contradictions are so blatant that the only reasonable explanation is that the whole story is fake. 2) Hieronimous is still not able to demonstrate a matching costume, even with expert assistance. As the Hieronimus crew continues to introduce new costumes, to more closely approximate the Patterson creature, the more obvious it is that Hieronimus didn't have anything do with it the first time either. 4) His explanation for why he never asked for the $1,000 from Gimlin or Patterson ... doesn't make any sense. Many things in his confession make no sense. 5) When Hieronimous is asked why he's telling this story to the public 40 years later, he says "It's my turn now" ... refering to the other parasite scammers who have made claims about the footage in previous years. 6) The comparative visuals clearly show that the Patterson creature has a different skeleton than Bob Hieronimous (or any human, for that matter). See the comparative footage on the left. Hieronimus said Roger Patterson killed a red horse and made a costume from its heavy, stinking hide. "Roger skinned out a dead red horse ... [The costume] stunk ... It weighed maybe twenty, twenty five pounds. It was a little bit heavy ... Horsehide would be heavy." "It was made of three parts. It had legs. It had a corset or middle piece between the neck and waist. And it had a head." Hieronimus' first story described his costume as a heavy costume made from the hide of a red horse. He says it stunk like a dead animal. Hieronimus subsequently agrees that the costume was a simple, gorilla costume, manufactured by Morris Costumes in North Carolina in the 1960's. In this second version of his confession, the fur of the creature was dynel nylon threads stitched to a woven cloth backing -- nothing like the hide of a "dead red horse" that he previously described. This dramatic modification of his original "confession" was prompted by a publicity-hungry costume maker in North Carolina named Phillip Morris. Morris also wanted to take some credit for the Patterson footage, somehow, and possibly market a new costume. Although Morris has no records showing the sale of a costume to Roger Patterson, he is nevertheless certain that he provided the costume used in the famous footage. 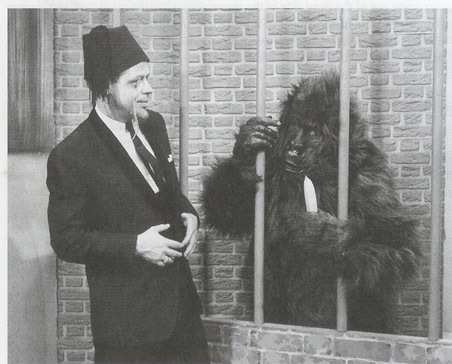 Morris claims that a man named Roger Patterson bought a discount gorilla costume. Somehow he remembers that sale, though there is no record of it. He also claims he "recognized" the gorilla costume when he saw the Patterson footage on TV one day. How coincidental! The photo on the upper right shows the costume Morris "recognized" from the Patterson footage. A photo of the gorilla costume Hieronimus said was used. The man in the photo is costume maker Phillip Morris. In this same photo Morris appears as his "Dr. Evil" TV host character. The TV show was a horror film showcase which aired in the 1950's in the southern United States. Prior to his recent claims about the Patterson footage, Morris got media attention for his demands for compensation from the producers of the Austin Powers film series. Morris claimed the Mike Meyer's "Dr. Evil" character infringed on Morris' previously unregistered trademark for an obscure line of "Dr. Evil" costume products. Lawyers for the Austin Powers producers easily demonstrated that the two different "Dr. 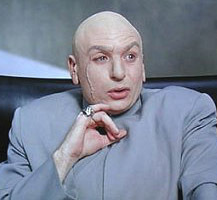 Evil" characters were developed independently, and would not be confused by the public. Mike Myers as "Dr. Evil"
Sometime after Costume Description #2, Hieronimus and Morris came up with a new costume replica of the Patterson creature, which Morris said he could make more duplicates of for 7-8 thousand dollars. The latest costume is a custom-made, latex-enhanced non-stretching quirky creation. It's a very far cry from what Hollywood special effects folks say would have been required, and nothing like the simple gorilla costume that Morris originally claimed was sold to Patterson in the 1960s, which Morris claimed he "recognized" on TV when he saw the Patterson footage. The Version #3 Costume is pictured on the right. It is held up by Morris and Hieronimus. The images on the right are from the last television story done about Bob Hieronimus, on the local news channel in Yakima. At the height of the scam, television and newspaper reporters in Yakima ran with the Hieronimus "confession" story without paying much attention to the blatant, graphic inconsistencies.